This post is going to be long, and updated as much as possible. 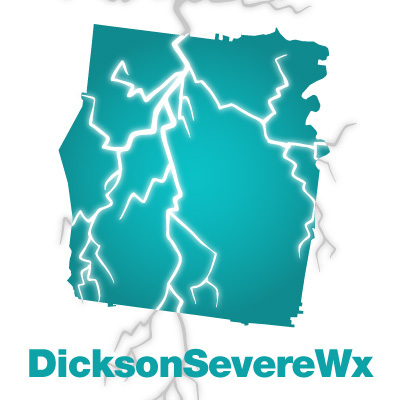 Latest info can be found on Twitter @DicksonSevereWx. 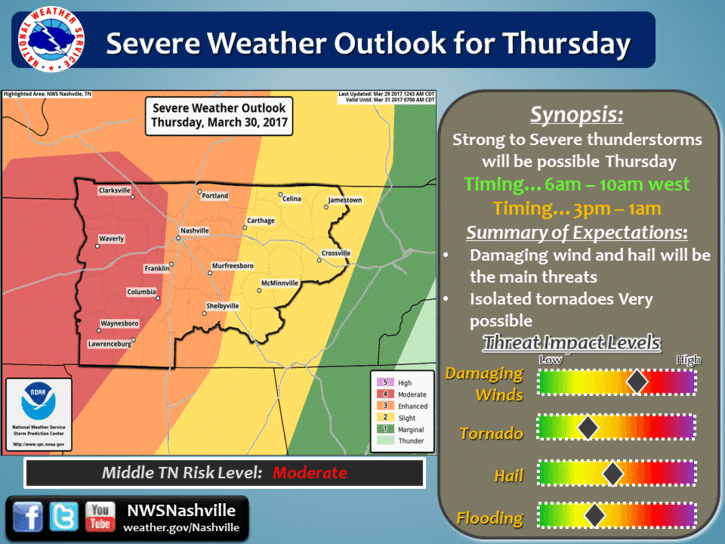 Thursday, we are expecting a significant severe weather event through the afternoon and early evening hours. The SPC has us outlooked in the MODERATE risk of severe weather. That is a 4 on a scale of 0-5, with 5 being the highest risk. 45% chance of seeing severe weather (hail 1 inch or greater, 58mph+ damaging winds, tornado) within 25 miles of a point. 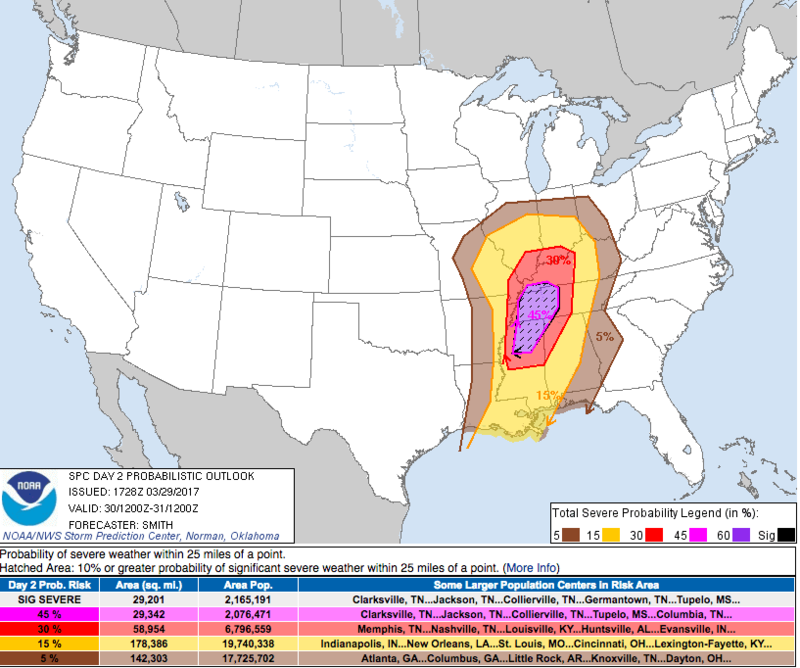 10% chance of seeing *significant* severe weather (hail 2 inches or greater, 70mph+ damaging winds, strong EF-2 or higher tornado) within 25 miles of a point. A strong storm system will approach Thursday, creating gusty south winds. Sustained winds of 15 to 25 will develop, with occasional wind gusts over 40 mph. Also, numerous thunderstorms are expected to develop, which could contain damaging winds. 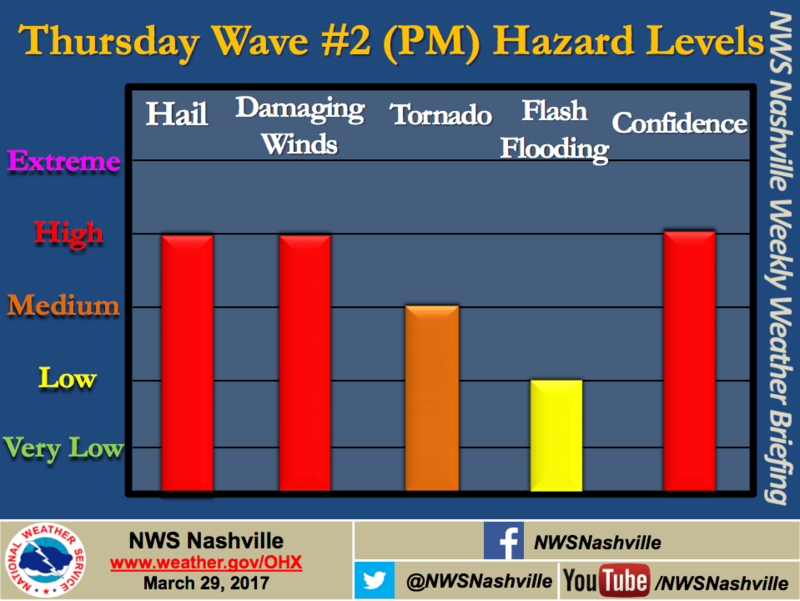 We are expecting severe weather in two waves: a morning wave and afternoon wave. The morning wave will be remnants of storms from overnight from our west. They could be strong to severe, with a possible tornado. This wave though will be weakening as it gets to us. 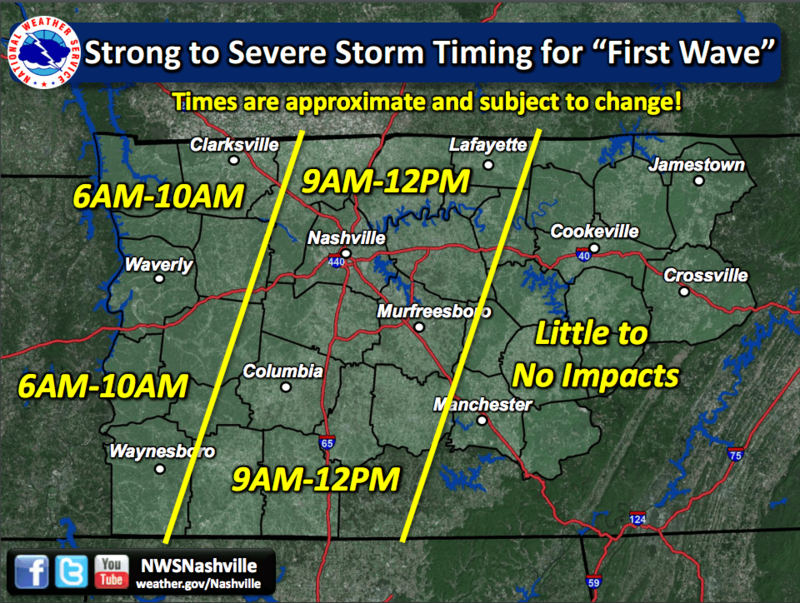 Here’s NWSNashville’s timing on the first wave. It’s the second line that has our attention, in particular the second line and what forms *between* the lines. 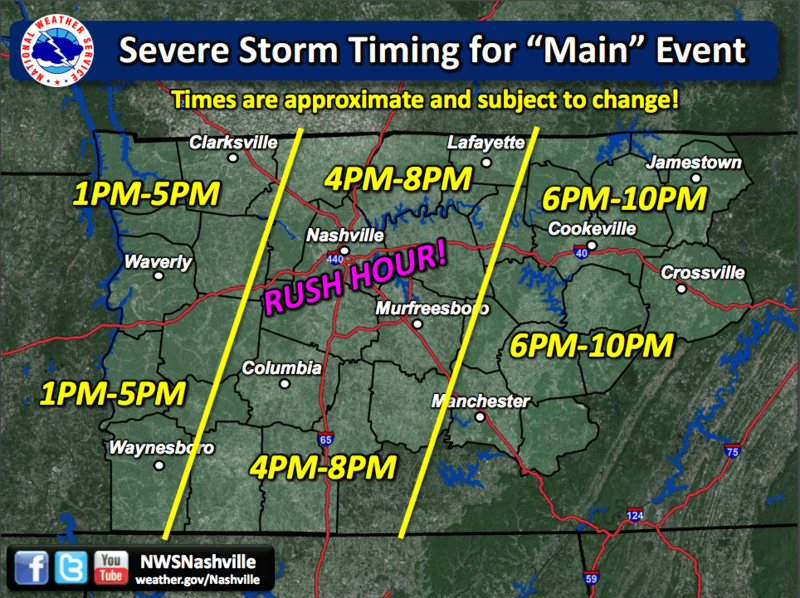 Here’s the timing for the second wave, as stated by NWSNashville (important: times are estimates and subject to change). 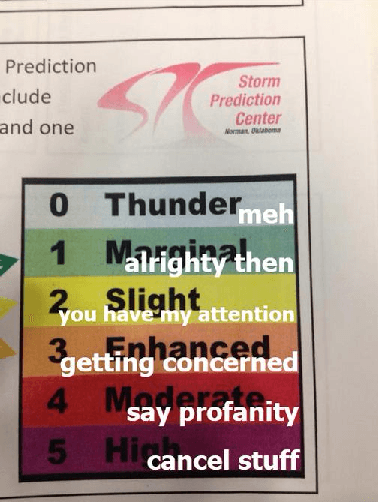 Main concern/uncertainty: After the first wave comes through is when the MODERATE risk kicks in, sort of speak. If the first wave comes through and takes the clouds with it, giving us sunny skies again, the sun then will cause the atmosphere to become unstable. This instability (also known as CAPE or convective available potential energy for the weather nerds), acts as storm fuel for the storms. The concern is that there will be enough instability between the first and second wave that a few super cells may develop ahead of the second wave. If these super cells develop, we have to start watching for tornados, as they will have all the ingredients needed to rotate. 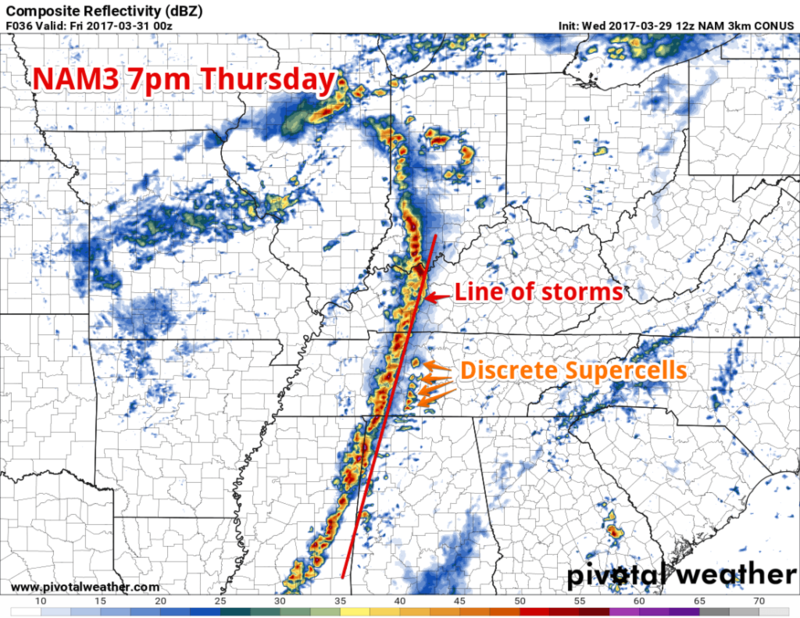 NAM3 currently points out the possibilities for supercells. The below is a simulated radar of what the NAM3 model shows for reflectivity (or the traditional radar view) for 7pm Thursday. Note: don’t get hung up on where the storms are precisely or the timing, as it is just a guess. The main threats with the second wave noted above are damaging winds, large hail, and tornados. The time to prepare for these storms is now. The best way to be safe during severe weather is to plan ahead of time your action plan when under a warning, where you will go when a warning is issued, and what you should have in your safe space. You do not want to be figuring out what to do when under a warning. Give yourself ample time to get to your safe spot, especially if you have kids, elderly, or disabled members of your family/community in your care. It’s best to hang out in your safe spot longer than you want to, than to get caught not getting there in enough time. Make sure your phone is charged, weather radio has fresh batteries, and that you are always around a weather source throughout the day tomorrow. When is it exactly going to hit Dickson County? I can’t give you an exact ETA, as uncertainty exists with this storm, but expect the first wave to arrive around 6am to 10am in the morning, and the main, second wave to arrive between 2 and 6pm, with some strong to severe storms ahead of the main wave. Are they going to shut down school, since it will be arriving when kids are dismissed? I can’t speak for the school system, but my guess is that they have a plan in place to either dismiss early or hold kids until the storm passes. Does Dickson County have any storm shelters? No, Dickson County does not have any storm shelters they open *before* a storm arrives. Dickson County EMA recommends finding friends or family that you can stay with should you feel your home is not safe enough to be in the storms with (i.e. mobile home, manufacture home). Is the crawlspace of my home a good place to go to during a tornado warning? Absolutely not and this is not recommended. Go to the lowest level of your home, most interior room. For most homes this is a bathroom, closet, or small hallway. Put as many walls between you and the outside as possible. Will there be a tornado watch issued tomorrow? I can’t say that with certainty, but if I had to put my money on a “yes” or “no,” I’d be putting money on “yes.” If any watch is issued, it will more than likely be a tornado watch. Is there a chance this forecast could bust? Yes, and that would be a good thing. If this forecast were to “bust,” that means that the atmosphere didn’t get unstable enough between the two waves of storms to fuel the second wave, and the second wave of storms won’t be as bas as currently forecasted. While there are some extremely smart people handling the forecasts, let’s hope the forecast is a bust as that means lives and property will be spared the worst of it.